Until 1995, no one knew where spectacled eiders spent the winter months. The spectacled eider is a medium-sized sea duck measuring an average 53 cm in length for males and 50 cm in length for females. Adult male breeding plumage is characterized by a white back and a black tail, belly and chest. Other distinguishing characteristics include a bright orange bill with white feathers at the base, and a green shaggy head with round white “spectacles” around each eye. Adult female breeding plumage is a dull brown color with darker brown barring and light brown eye patches. Both sexes have long sloping foreheads. The male spectacled eider is unmistakable with its green head and round white eye patches. The female may be more easily confused with the females of other eider species. However, a distinct characteristic of the female spectacled eiders are the round patches of slightly lighter brown feathers around the eyes. The female spectacled eider is also comparatively duller and paler in color with less distinctive barring than the females of other eider species. Spectacled eiders arrive on the breeding grounds as pairs in late-May or in June. Preferred nest sites appear to be on islands or peninsulas in lakes. Nest initiation typically occurs in May-July and varies according to numerous factors that include latitude and weather. Females generally lay 3-9 oval, olive-green eggs at an average rate of one egg every 24 hours. Males depart the breeding areas sometime during egg-laying and early incubation, leaving the females to care for the eggs. The females incubate the eggs 24-28 days and tend to the young after they hatch. Ducklings are covered in down when they hatch. Young spectacled eiders learn to fly at 50-52 days of age and fledge in late August. Young eiders will remain at sea until their first breeding attempt at 2-3 years of age. Egg and duckling predators in Alaska and Russia include mink, Arctic fox, red fox, gulls, and jaegers. Hen eiders will take their young to open water, or to hide in emergent vegetation in response to avian attacks. Spectacled eiders feed by diving and dabbling. In the nonbreeding season, they are found in marine waters diving down to feed on benthic mollusks and crustaceans in shallow waters (less than 80m deep) or free-floating amphipods in deeper waters. During the nesting season, they forage in ponds by diving and dabbling, often feeding on aquatic insects, crustaceans, mollusks, and vegetation. They will also feed on grasses, berries, and seeds. Spectacled eiders generally congregate in large, dense flocks in the winter in small openings in the sea ice. Outside the winter, they typically fly in small, compact flocks of less than 50 individuals. They typically fly with a rapid wing beat less than 50m above the ground or water. Males may chase each other to compete for females during the breeding season, however, physical contact is rare. Spectacled eiders are believed to follow a monogamous mating system. Spring migration from the wintering area includes multiple stopovers at coastal sites with arrival on the breeding grounds in late May or June. Males leave 1-2 weeks after incubation of the eggs begins. Females and young eiders travel to their wintering grounds in late summer. 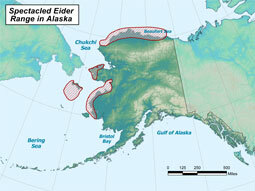 After spectacled eiders leave the nesting grounds, they travel along established migration corridors in the Bering, Chukchi, and Beaufort seas. Males molt and stage in Mechigmenskiy Bay in Russia, eastern Chukotka Peninsula in Russia, or in Ledyard Bay, Alaska. The females molt and stage in eastern Norton Sound if they nested in the Yukon-Kuskokwim delta or in Ledyard Bay and Mechigmenskiy Bay if they nested on the North Slope. From these molting and staging areas, the birds will head out to the Bering Sea for the winter. 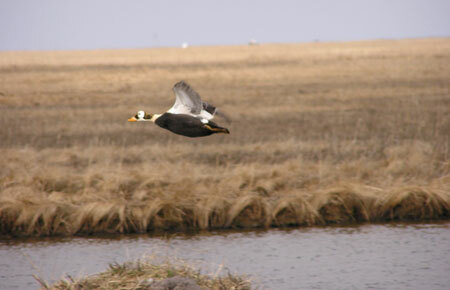 The breeding habitat of spectacled eiders is in wet tundra regions. They nest along Arctic coasts of Alaska and Russia and on the Yukon-Kuskokwim Delta in Alaska. Molting areas have been found in Norton Sound and Ledyard Bay in Alaska and in Mechigmenskiy Bay and offshore waters between the Kolyma and Indigirka river deltas in Russia. In the winter, the entire global population of spectacled eiders congregates in gaps in the sea ice (called polynyas) in the Bering Sea between St. Lawrence and St. Matthew Islands. The wintering habitat of spectacled eiders was unknown until the 1990s. They use these gaps in the ice to dive down and collect mollusks and other crustaceans from the sea floor. The current population level of spectacled eiders is significantly lower than historical levels. The species is listed as threatened under the Endangered Species Act (ESA) and is a State of Alaska species of special concern. Current nesting population is ~8,000 breeding pairs in Alaska and ~140,000 individuals in Russia. To learn more, visit the ADF&G Special Status page for spectacled eider. The population of spectacled eiders has declined significantly since the 1960s, but the cause of this decline remains unknown. On the Yukon-Kuskokwim Delta, the population declined by over 96% between the 1970s and 1990s. Following this dramatic decline, the population appears to have stabilized. Threats to the spectacled eider include lead poisoning, predation, overharvest, reduced prey availability, and catastrophic events. Though the cause of the decline in spectacled eiders is unknown, lead poisoning from ingestion of spent shot has been a significant source of mortality in Alaska. The use of lead shot was banned in 1991 so the threat from lead poisoning should be reduced though illegal use may continue at some level. In nesting areas, predation by foxes, gulls, and ravens may be preventing the recovery of the species. Predation tends to be higher in areas near human habitation due to the year-round availability of food and shelter for certain predators. Overharvest is not thought to be the driver behind the reduction in spectacled eider populations. However, it is possible that subsistence harvest of this species may hinder its recovery. Reduced prey availability is another potential threat to spectacled eiders. Regime shifts due to climate change may alter prey assemblages in the eider’s habitat. The spectacled eider may also compete for their prey with commercial fisheries. The spectacled eider’s habit of concentrating in large flocks during the winter and molting periods makes it very vulnerable to catastrophic events, such as an oil spill or bilge pumping. Any catastrophic events in the area of these flocks could have a major impact on the entire population.